This article is about the band. For the band's eponymous album, see Vampire Weekend (album). Vampire Weekend is an American rock band from New York City, formed in 2006 and currently signed to Columbia Records. The band was formed by lead vocalist and guitarist Ezra Koenig, multi-instrumentalist Rostam Batmanglij, drummer Chris Tomson, and bassist Chris Baio. The band's first album Vampire Weekend (2008)—which included the singles "Mansard Roof", "A-Punk", "Oxford Comma", "Cape Cod Kwassa Kwassa", and "The Kids Don't Stand a Chance"—was acclaimed by critics for its world music influences. Their following album, Contra (2010), was similarly acclaimed and garnered strong commercial success. Their third studio album, Modern Vampires of the City (2013), won the group a Grammy Award for Best Alternative Music Album in 2014. Batmanglij departed the group in early 2016. The band's fourth album, Father of the Bride, is scheduled to be released in 2019. The band members met while enrolled at Columbia University, beginning with a rap collaboration between Koenig and Tomson named "L'Homme Run". They bonded over a shared love of punk rock and African music. Koenig toured with The Dirty Projectors during a period of experimentation with African music, inspiring the band to incorporate world sounds into their earliest work. 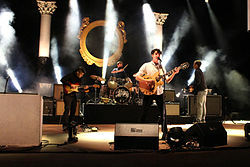 The band chose the name "Vampire Weekend" from the title of a short film project Koenig worked on during the summer between freshman and sophomore years in college. While home for the summer, Koenig watched a 1980s vampire film (The Lost Boys) and was inspired to make a Northeastern version of the film in which a man named Walcott travels to Cape Cod to warn the mayor that vampires are attacking the United States. Koenig abandoned the project after two days. The band began playing shows around Columbia University, starting with a battle of the bands at Lerner Hall in 2006. After graduating from college, the band self-produced their debut album while simultaneously working full-time jobs, Tomson as a music archivist and Koenig as a middle school English teacher. In 2007, Vampire Weekend's song "Cape Cod Kwassa Kwassa" was ranked 67th on Rolling Stone's list of the "100 Best Songs of the Year." In November 2007, they toured the UK with The Shins. The then-nascent influence of blog hype and internet buzz played a role in their success and led to a large prerelease following sufficient to support them performing on three tours before their debut album was released. They were declared "The Year's Best New Band" by Spin magazine in the March 2008 issue, and were the first band to be shot for the cover of the magazine before releasing their debut album. The band made a television appearance on The Late Show with David Letterman on February 1, 2008, and on March 8, 2008, performed on Saturday Night Live. Four songs from the band's first album also made the Triple J Hottest 100, 2008. The internet hype had its backlash, however, as critics reacted against a perceived image of Vampire Weekend as privileged, upper-class Ivy League graduates stealing from foreign musicians. One critic went so far as to call Vampire Weekend the "whitest band in the world," to which they took exception, given their Ukrainian, Persian, Italian and Hungarian heritages. Koenig responded in a November 2009 interview by saying, "Nobody in our band is a WASP." Furthermore, the backlash involving their social backgrounds was largely unfounded, as Koenig explained in the interview that the band members got into Columbia on scholarship and used student loans; he himself was still paying off student loans in 2009. The band's first album Vampire Weekend was released January 29, 2008. A success in the US and UK, it peaked at number 15 on the UK Albums Chart and number 17 on the Billboard 200. Four singles were released from the album; while "A-Punk" peaked at number 25 on the Billboard Modern rock chart and number 55 on the UK Singles Chart, "Oxford Comma" peaked at number 38 in the UK. "A-Punk" was ranked the 4th on Rolling Stone's Readers' Rock List: Best Songs of 2008. "A-Punk" was also used to open the Will Ferrell/John C. Reilly feature Step Brothers, and featured in the UK television show The Inbetweeners and the video games Guitar Hero 5, Just Dance 2 and Lego Rock Band. The band's second album, Contra, was released on January 11, 2010 in the UK and the following day in the US, after being pushed back from the original release date for the fall of 2009. The album's first single, "Horchata", was released on October 5, 2009. The album's second single, "Cousins", was released as a single on November 17, 2009. Initial copies of the CD and LP sold at independent records stores in the US include a 3-track bonus CD containing two "melts", which featured bits of album tracks and a remix. Contra was the band's first album to debut at No. 1 on the Billboard 200. On January 9, 2010, the band did an acoustic show for MTV Unplugged. The following month, the band toured Europe and Canada with Canadian electro duo Fan Death as their support. The video for their next single "Giving Up the Gun" was also released on February 18, 2010 which included cameos from Joe Jonas, Lil Jon, RZA and Jake Gyllenhaal. They also played festivals across the USA such as Coachella, Bonnaroo, Austin City Limits Music Festival, All Points West and the Groovin' The Moo festival in Australia. Their third single, "Holiday", was released on June 7, 2010. On June 25, 2010, the band played the Pyramid Stage at Glastonbury Festival, in Pilton, Somerset, UK. The band were also on the main stage at T in the Park 2010 at Balado Kinross, Scotland, on June 8, and played the Oxegen Festival in Ireland on July 9. They also headlined the Latitude Festival in Suffolk, UK on July 18. On 16 July the band headlined the Main Stage at the Festival Internacional de Benicàssim. In the summer of 2010 the band played at the Utopia stage on Peace and Love, Sweden's biggest Festival. On July 30, 2010, the band played at Jisan Valley Rock Festival in South Korea. In 2010, Vampire Weekend embarked on a North American tour with Beach House and Dum Dum Girls. The tour started off on August 27, 2010, in Vancouver, British Columbia at the Malkin Bowl. Koenig mentioned to the audience that before this concert, the band had the longest "vacation period" that they have had in a while. Contra was nominated for a Grammy for Best Alternative Music Album, but lost to The Black Keys's Brothers. On November 11, 2011, it was revealed that Vampire Weekend had been in the studio, writing and recording material for their third album. On April 26, 2012, Rolling Stone reported that the new album could be released by the end of the year. Koenig said, "We do have a ton of stuff. It would be cool if it was [released] this year...We just never want to be in a position [where] when we put out something, we feel could've benefited from more time." Until its release, the band was discreet about the details of the next album, stating that a band "can give a bunch of interviews when they're working on stuff" but they "don't want something [they] said six months ago to influence how people hear it when it's done." Modern Vampires of the City was released in May 2013, and written and recorded in various locations including SlowDeath Studios in New York, Echo Park "Back House" in Los Angeles, Vox Recording Studios in Hollywood, Rostam Batmanglij's New York apartment and a guest house on Martha's Vineyard. The album was co-produced by Batmanglij and Ariel Rechtshaid. After Batmanglij produced the first two albums himself, this marked the first time the band worked with an outside producer on any of their records. In an interview for the February 2013 edition of Q (released in mid-January), Koenig described the upcoming album as "darker and more organic" and "very much the last of a trilogy". Says Koenig, "Things that we might have found boring in the past, we've started to find more fresh. This album has more piano and acoustic guitar and organ." Modern Vampires of the City also marks the band's first use of digital voice modulation, as heard in the songs "Diane Young" and "Ya Hey." (first use was actually in the song "California English" on Contra)  The album was recorded and co-produced by Ariel Rechtshaid in his Los Angeles Studio (alongside Batmanglij). The band discussed the album with The FADER and appeared on the cover of the magazine's 84th issue. On March 16, 2013, the band played the closing show at Stubbs on the last day of the SXSW festival in Austin, Texas. In the show they played two new songs from the upcoming album: "Diane Young" and "Ya Hey". On March 18, 2013, Vampire Weekend released a double-sided single, "Diane Young"/"Step". On May 11, 2013, Vampire Weekend were featured as the musical guest on Saturday Night Live with Kristen Wiig hosting, their third time on the show. Released on May 14, 2013, the album debuted at #1 on the Billboard chart, marking the second time Vampire Weekend has achieved the feat: its second album Contra also debuted at #1 in 2010, making them the first independent rock band to enter the charts at #1 with two consecutive releases. Modern Vampires of the City also shattered the previous record for first week vinyl sales, moving nearly 10,000 units on vinyl alone and debuting at #1 on the Soundscan Vinyl Charts. Additionally, the band charted #1 at Indie, Alternative, Digital and the top 200. In 2014, Modern Vampires of the City won a Grammy for Best Alternative Music Album. After remaining quiet following the conclusion of their Modern Vampires tour, which wrapped up in September 2014, it was revealed on January 26, 2016 that Rostam Batmanglij had departed the band. He noted that he and Koenig would continue to collaborate. Later the same day, Koenig announced that Vampire Weekend was in the studio working on their upcoming fourth album, with Batmanglij contributing to the record. The album's working title was revealed to be Mitsubishi Macchiato. In April 2016, the band briefly performed at a rally for presidential candidate Bernie Sanders in Washington Park Square. Koenig has been a well-known supporter of Sanders, after discussions on his Beats 1 radio show, Time Crisis. The band performed live with Dave Longstreth of the Dirty Projectors, which marked their first performance as a trio. In late 2016, Koenig was reportedly in talks to sign the band with Columbia Records, as he reportedly "hit it off" with executive, Rob Stringer. Initially, this news was regarded a rumour, until the band's website revamp in 2018, in which a Sony Music copyright appeared on the site. In March 2017, Koenig revealed in an elaborate Instagram update that during 2016 he had spent countless hours researching and writing music in libraries with grad students. Additionally, he revealed that the album, given the working title of "Mitsubishi Macchiato", would feature a more 'spring-time' vibe and one of the songs would be entitled Flower Moon. Koenig revealed that LP4 would be partially inspired by the songwriting of country singer, Kacey Musgraves, after he attended one of her shows in September 2016. In an interview with Stereogum, he stated, "I’m the type of person who has spent hours poring over the avant-garde poetic lyrics of certain songwriters, and there was something that felt so good [about how] from the first verse, you knew who was singing, who they were singing to, what kind of situation they were in. After the show I realized there’s not a ton of Vampire Weekend songs where you could listen to the first verse and immediately answer the question of who’s singing and who are they singing to.” Furthermore, in a September 2017 interview with Zane Lowe, Ezra briefly spoke about LP4 and stated that it was "about 80% done." He mentioned that the album would feature lead producer, Ariel Rechtshaid, with additional "guest appearances", one of which being Batmanglij. Lowe pushed Koenig for a release date, citing Q1 2018 as a likely candidate. In a December 2017 interview, Koenig noted that Batmanglij was involved in a few songs, some of which was material that they had started working on long ago, and that their method of collaboration had not changed despite the latter's departure from the band. Vampire Weekend's first gigs since the hiatus took place in Ojai, California on June 16 & 17. On January 31, 2018, it was announced that the band would be headlining the UK music festival End of the Road. The festival ran from August 31 to September 3 and marked Vampire Weekend's first return to a festival stage in 4 years. On July 21, they performed in Byron Bay for the Australian festival, Splendour in the Grass. Additionally, it was announced that they would headline the 2018 Fuji Rock Festival, scheduled for July 27 to 29. For their live shows, the core trio of Koenig, Baio and Tomson has been augmented by Greta Morgan on keyboards, guitar and vocals, Brian Robert Jones on guitar, Garrett Ray on percussion, drums and vocals, and Will Canzoneri on keyboards and vocals. During their August 4, 2018 performance at Lollapalooza, where the band played fan favorite "A-Punk" three times in a row, Koenig announced that Vampire Weekend's 4th album was done. On January 17, 2019, Koenig announced the abbreviation of the band's fourth album title as FOTB, and revealed that the album consisted of 18 songs, running at approximately 59 minutes. He also announced that the album would be promoted by three monthly two-song drops, beginning the following week. In an interview with Beats 1 host Matt Wilkinson the day "Harmony Hall" and "2021" dropped (January 24, 2019), Koenig confirmed the title of the album as Father of the Bride, also stating that the record would feature an array of collaborators, including Rostam Batmanglij, marking the first time the band has included guest vocalists in an album. In an interview with Rolling Stone, Ezra Koenig said, "We’ve had three albums of the same voice over and over again. I like the idea of opening up our world a little bit.” He also confirmed that 2021 features a Haruomi Hosono sample, and said that he planned to start work on Vampire Weekend’s fifth album. In 2010, the band, along with their record company XL Recordings and photographer Tod Scott Brody, were sued by Kirsten Kennis, the model on the cover of Contra, over the use of her image. Kennis' accusations were that the band used her image without her permission. Vampire Weekend settled with Kennis in 2011. In January 2012, President Barack Obama added Vampire Weekend to a short list of musical artists that he sought support from for his re-election campaign. Vampire Weekend made it onto this list with Jay-Z, John Legend, and Alicia Keys. In January 2016, the band performed in Iowa for a Bernie Sanders rally two days before the Iowa primaries. The band members Rostam Batmanglij and Chris Baio were replaced by David Longstreth and Nat Baldwin (both from Dirty Projectors) and an all female a cappella group from the University of Iowa, due to Batmanglij's departure from the band and Baio being on tour with his side project. Lead vocalist Ezra Koenig expressed his support for the candidate in various ways through social media and on his Beats 1 show "Time Crisis". Vampire Weekend contributed a cover of "Exit Music (For a Film)" for Stereogum Presents... OKX: A Tribute to OK Computer (2007), a free tribute album celebrating 10 years of Radiohead's album OK Computer. They have also covered "Everywhere" by Fleetwood Mac, "Ça Plane Pour Moi" by Plastic Bertrand, "I'm Goin' Down" by Bruce Springsteen, "Have I the Right?" by The Honeycombs, "Blurred Lines" by Robin Thicke, "Fight For This Love" by Cheryl Cole and "Ruby Soho" by Rancid. The band also contributed the song "Ottoman" to the soundtrack to the 2008 film Nick and Norah's Infinite Playlist. Ottoman was then sampled by alternative hip-hop artist Kid Cudi. Two tracks from their debut record also appeared in the 2009 comedy I Love You, Man. A new song, "Jonathan Low", was released on June 8, 2010, appearing on the soundtrack to the third installment of the Twilight Saga films, Eclipse. The song "Worship You" was featured in the soundtrack for the 2013 EA Sports video game FIFA 14. In 2014, Vampire Weekend contributed a cover of "Con te Partiro" by Andrea Bocelli on the Valentine's Day compilation, Sweetheart 2014. Vampire Weekend also contributed a cover of Bruce Springsteen's "I'm Goin' Down" on the Girls Vol. 2 Soundtrack. In 2018, the band's songs "'M79", "The Kids Don't Stand a Chance" and "Cousins" were featured in the family film adaption Peter Rabbit. Koenig also wrote the original track, "I Promise You" for the film. ^ "Vampire Weekend Revamp Website | Pitchfork". pitchfork.com. ^ "Vampire Weekend Reportedly Sign To Columbia For LP4". Stereogum. 18 November 2016. ^ "The 2014 Grammy Awards". Electronic Musician. ^ "Video Hits Interview Vampire Weekend". YouTube. Retrieved 2012-04-09. ^ "Vampire Weekend interview (PSL)". YouTube. Retrieved 2012-04-09. ^ a b c "Interview: Vampire Weekend". Artist Direct. 2008-01-23. Retrieved 2013-04-03. ^ Josh Eells (2010-02-04). "The Semi-Charmed Life of Vampire Weekend". Retrieved 2016-09-23. ^ "A few more facts about Vampire Weekend | al.com". Blog.al.com. Retrieved 2012-04-09. ^ "Vampire Weekend with Beach House opening". Facebook. 2010-09-01. Retrieved 2012-04-09. ^ "The 100 best Songs of 2007". Rolling Stone. 2007-12-27. ^ "Rolling Stone Magazine The 100 Best Songs Of 2007". Rolling Stone. 2007-12-27. ^ "Vampire Weekend To Tour With The Shins". Angryape. 2007-10-11. Archived from the original on 2011-08-09. Retrieved 2008-06-19. ^ "Vampire Weekend Interview @ Rock Werchter 2008". YouTube. 2012-01-13. Retrieved 2012-04-09. ^ Greenwald, Andy. "Vampire Weekend: The Graduates". Spin. February 25, 2008. Retrieved on June 28, 2009. ^ "Vampire Weekend's Eponymous Debut Turns 10". Salute. Retrieved 31 January 2018. ^ "Vampire Weekend's 'SNL' Appearance Prompts Major Sweater Backlash". Vulture. Retrieved 31 January 2018. ^ Rock and Pop Features (March 31, 2010). "Vampire Weekend interview". London: Telegraph. Retrieved 2012-04-09. ^ a b c "Vampire Weekend Interview - An Interview with Ezra Koenig of Vampire Weekend". Altmusic.about.com. 2009-11-23. Archived from the original on 2013-02-11. Retrieved 2012-04-09. ^ "Readers' Rock List: Best Songs of 2008". Rolling Stone. 2008-12-22. Retrieved 2013-05-31. ^ Levine, Mike (February 1, 2010). "Back for a Second Bite". eMusician. Retrieved September 23, 2016. ^ Caulfield, Keith (2010-01-20). "Vampire Weekend Lands First No. 1 Album". Billboard. Retrieved 2010-01-20. ^ Rothfeld, Michael (2010-07-20). "The Vampire Weekend Suit: Much Ado About an Old Photo - Law Blog - WSJ". Blogs.wsj.com. Retrieved 2013-05-13. ^ Hyman, Dan. "Vampire Weekend Hatching 'A Ton' of Material for New LP". Rolling Stone. Retrieved 16 May 2012. ^ "Vampire Weekend Bassist Goes Solo - WSJ.com". The Wall Street Journal. ^ "Nothing As It Seems". Electronic Musician. June 2013. ^ Eliscu, J. (2013, Jan 31). “Vampire Weekend Find New Direction.” Rolling Stone, 28. ^ "VAMPIRE WEEKEND : contra costa | contra mundum, Vampire Weekend in Q Magazine's 2013 Forecast". Teamvampireweekend.tumblr.com. Retrieved 2013-05-13. ^ "Vampire Weekend: Upper Classmen". ^ ""Billboard" Charts: Over the Counter - Vampire Weekend Scores First No. 1 for ADA". Billboard - The International Newsweekly of Music, Video and Home Entertainment. ^ "Modern Vampires of the City Awards". Retrieved February 13, 2014. ^ "2013 Alternative Music Grammy Awards". Retrieved February 10, 2015. ^ Phillips, Amy (26 January 2016). "Rostam Batmanglij Quits Vampire Weekend". Pitchfork. Retrieved 26 January 2016. ^ Grebey, James (26 January 2016). "Rostam Batmanglij Quits Vampire Weekend". SPIN. Retrieved 26 January 2016. ^ Blistein, Jon (January 26, 2016). "Ezra Koenig Talks New Vampire Weekend LP, Rostam Batmanglij's Exit". Rolling Stone. Retrieved January 27, 2016. ^ "Vampire Weekend and Dirty Projectors Play Bernie Sanders Rally in New York: Watch | Pitchfork". pitchfork.com. ^ Brennan, Collin (18 November 2016). "Vampire Weekend rumored to have signed with Columbia for new album in 2017". Consequence of Sound. Consequence of Sound. ^ "Vampire Weekend Revamp Website | Pitchfork". pitchfork.com. Pitchfork. ^ "New Vampire Weekend Album Is Inspired By Kacey Musgraves, Features Ariel Rechtshaid And Rostam". Stereogum. 11 December 2017. ^ "Ezra Koenig Shares Update On New Vampire Weekend Album". Stereogum. 19 September 2017. ^ Brown, Eric Renner (11 December 2017). "Ezra Koenig previews Vampire Weekend's fourth LP: 'You want to age gracefully and not boringly'". Entertainment Weekly. Retrieved 30 July 2018. ^ "Home - End of the Road". End of the Road. Retrieved 2018-02-02. ^ Wicks, Amanda (January 31, 2018). "Vampire Weekend Announce First Show in 4 Years". Pitchfork. Pitchfork Media. Archived from the original on January 31, 2018. Retrieved January 31, 2018. ^ "Fuji Rock Festival announces first wave of acts for 2018 – Kendrick Lamar, N.E.R.D., Skrillex, Vampire Weekend, CHVRCHES, and more". Bandwagon Asia. February 9, 2018. ^ a b Gray, Julia (June 14, 2018). "Greta Morgan, Brian Robert Jones Join Vampire Weekend Touring Lineup". Stereogum. Retrieved June 17, 2018. ^ a b Baio, Chris (June 18, 2018). "Thanks so much to everyone for making the Ojai shows so special this weekend..." Twitter. Retrieved June 19, 2018. ^ Gallucci, Nicole (August 5, 2018). "Vampire Weekend opened Lollapalooza set with 'A-Punk,' 'A-Punk,' and 'A-Punk'". Mashable. ^ "Vampire Weekend Say Their New Album Is Done". Pitchfork Pitchfork. Retrieved 2018-08-05. ^ Koenig, Ezra (January 17, 2019). "To the fans". Retrieved January 18, 2019 – via Instagram. ^ "Vampire Weekend Return After Six Years With 'Harmony Hall,' '2021'". Rolling Stone. January 24, 2019. Retrieved January 24, 2019. ^ Reed, Ryan; Reed, Ryan (2019-01-30). "Vampire Weekend Plot North American 'Father of the Bride' Tour". Rolling Stone. Retrieved 2019-01-30. ^ "Rostam Batmanglij Quits Vampire Weekend". Pitchfork. January 26, 2016. Retrieved January 26, 2016. ^ Flint, Jessica (24 August 2010). "Vampire Weekend's Mutinous Muse". Vanity Fair. Retrieved 30 April 2016. ^ "Legal Matters". Billboard- The International Newsweekly of Music, Video, and Home Entertainment. ^ Michaels, Sean (16 August 2011). "Vampire Weekend settle lawsuit with Contra cover star". The Guardian. Retrieved 30 April 2016. ^ "President Obama seeks support from Arcade Fire, Vampire Weekend, Jay-Z on re-election campaign | News". Nme.Com. 2012-01-18. Retrieved 2012-04-09. ^ "Watch Bernie Sanders Sing With Vampire Weekend at Iowa Rally". Retrieved 2016-09-15. ^ Puglise, Nicole (2016-06-20). "Vampire Weekend frontman on the 'end of the road' for Bernie Sanders". The Guardian. ISSN 0261-3077. Retrieved 2016-09-15. ^ John Gentile (January 7, 2014). "Vampire Weekend Make Timeless Love on 'Con te Partiro' - Premiere". Rolling Stone. Retrieved February 11, 2014. ^ Cain Rodriguez (January 14, 2014). "'Girls' Vol. 2 Soundtrack Features Vampire Weekend, Jenny Lewis, Cat Power & More". IndieWire. Retrieved February 11, 2014. Wikimedia Commons has media related to Vampire Weekend.